Often times, moulds, dust, and other allergens are mostly stacked in the windows. That is why maintaining their cleanliness is an important thing to do for your home’s health. If a member of the family is prone to allergies, then the more you need to look into it. Well, the best way to achieve a neat and hygienic result is to look for a window cleaning Perth professional. And you don’t need to worry about looking for one. These days, numbers of professional residential cleaning services have sprouted everywhere and they offer window clean-up nowadays. However, if you want to tidy it up yourself then you might need some professional advice to get an expert kind of clean. This article will give you some useful tips and insight on how to clean your window properly. And for you to achieve the best cleaning results, window cleaning Perth professionals encourage you to purchase all the necessary tools from a local hardware store. Most of the professional window cleaners use a large bucket to quickly and simply wash them at once. However, for homeowners, it does not require having a large bucket. In fact, any sizes of the bucket will work when washing the glass on a single home. As long as you can see that it fits a squeegee and a mop, then that will do. Squeegee is the most important tool in washing glass surfaces. This is why it is important to purchase a high-quality squeegee. Well, if a squeegee has three unassembled pieces namely the handle, channel, and the rubber, it will usually mean that it is a well-made tool. So, make sure to check if you have purchased the right one for your window cleaning Perth task. The right mop that you could use for an effective cleaning is the one that comprises of two separate parts. Namely, the sleeve which is the part that wipes away the dirt and the T-bar where the mop cloth hooks on. And if the sleeve happens to get dirty, you could simply wash it. Note that a quality tool can be reused multiple times. A sea sponge can be used for wiping up water from your window sills and frames. It could also be used to wash surfaces around it that are not made out of a glass like dirty frames. According to window cleaning Perth professionals, most cleaners use their own cleaning detergent like vinegar in warm water, and etc. Well, the problem with this type of mixture is that they do not create enough suds. Suds helps the rubber on a squeegee turn smoothly. It could also make it easier to see where there are excess watermarks that need to be wiped off. So, make sure to use detergent soap that works very well to cut through the dirt and grime on windows. And if you have all the necessary tools, you can now take the following steps to properly use them. You can then have an effective and expertly window cleaning. Now that you have all the necessary tools, the first step you could do is to fill your bucket halfway with water. Note, make sure to use cold water. Then add a few squirts of detergent to the water. Also, make sure not to add too much detergent or else your windows may dry out too quickly. Put your mop to the bucket and once the mop is wet and covered with detergent, you may rub it around the window until you are sure that all the stubborn dirt has been completely removed. And if there are any marks that the mop can’t get off, you may use a little triple fine bronze or a little elbow grease and plenty of soapy water on the window. Bring out the squeegee and make sure to hold it properly. Press down hard enough so that the squeegee will collect all of the water. Applying pressure to the squeegee makes it difficult to move freely whilst you’re on it. Also, use your squeegee to get off all the excess water right to the edges of your window. At first, you may notice some leftover watermarks in the middle of the glass. Well, with more practice, this watermark will cease to appear. 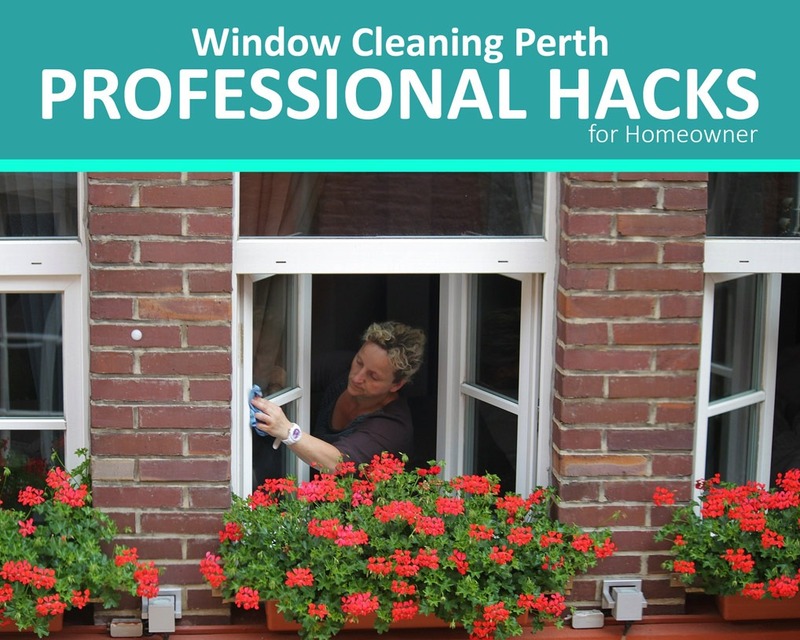 Window cleaning Perth expert recommends using a micro-fibre cloth to get rid of any visible watermarks. Another thing, to have a nice output is to make sure to use a clean towel or the sea sponge to wipe the frames, tracks, and sills. Who knows, there might be dirty water from cleaning the windows that now rest on the sill and frame edges. Last but certainly not the least is to clean the screens. Well, screen cleaning is relatively easy. First, you just need to remove the screen from the window opening. Second, soak your t-bar on a water with soap and gently start cleaning from top to bottom and side to side on both sides of the screen. After this, you may take your towel and gently wipe the screen mesh and frame until it dry. Once it’s dry, you may reinstall the screen. Note failing to clean the screen will contaminate the freshly cleaned window. Sounds easy to you right? Well, as you can probably guess cleaning your window is much more challenging than it sounds. In fact, it takes knowledge and experience to make a huge difference. And if you are a busy person who doesn’t find time to keep them clean and free from dirt, why not get someone to do it for you? Look for a professional cleaning services company that offers a window cleaning Perth service. In this way, you could achieve the best cleaning result you deserve. Maid in Perth offers convenient and cost-effective services to homeowners with the most spotless results. Call us today for more house cleaning services offers and talk with our team of professionals about your concerns and we’ll be happy to help. Also, are you planning to move and get your full deposit bond back? Then this article can give you a hand: How Do Professional Vacate Cleaning Perth Help Tenants Get Their Bond Deposit? This entry was posted in House Cleaning and tagged Deep Cleaning, house cleaning tips, Maid in Perth, window cleaning.